I recently stuffed a bunch of basil seeds into a pot of soil sitting on the kitchen windowsill. I remember thinking I'd be lucky if one of the 20+ seeds actually sprouted. Um, they all did as far as I can tell. While I was setting up my hot house seed started greenhouse, I went to work transplanting a bunch of the basil plants into yogurt cups so they could grow big and strong. I like using yogurt cups because they're something we ALWAYS have and they seem to be the perfect size for these little seedlings. I start out by drilling 3 holes in the bottom of all the cups at the same time by stacking them and drilling clear through them all. Next, I put a circle of paper towel in the bottom of each one. 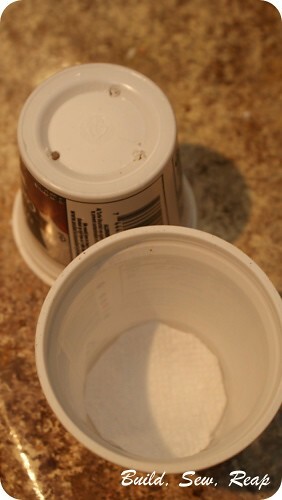 Doing this keeps the dirt from falling through the cup but still allows for the water to drain out or wick up if necessary. This year I'm trying something new with my little seedlings. Since I've never started so many seeds indoors before, I knew I needed to keep them out in the garage on the work bench. That means they all need a little extra TLC to stay warm and appropriately moist. I have a grow light out there but it does get pretty cold, especially at night. 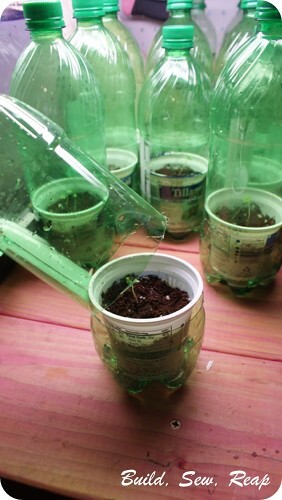 Thus, the soda bottle mini greenhouse. How did I get that in there? Well, simple really, I just cut almost all the way around the bottle, just a little bit lower than the height of the yogurt container. I left about 1/2 of an inch attached at the back. I made a whole bunch of these, one for each little basil plant. I filled the bottom of the soda bottle with water, slightly above the bottom of the yogurt container. 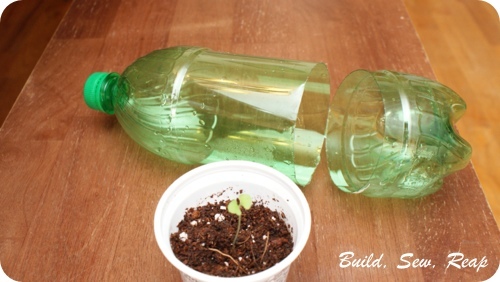 Now the soil can pull water as it needs it. 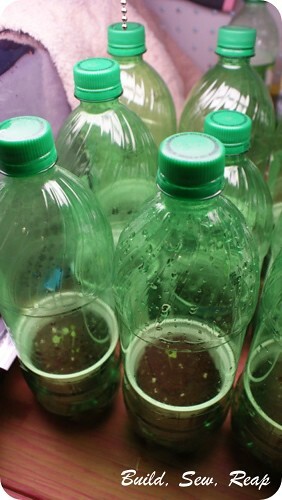 I'll check on it at least once a day to ensure it is functioning properly but after only about 30 minutes, the insides of the bottles are already a little steamed up. 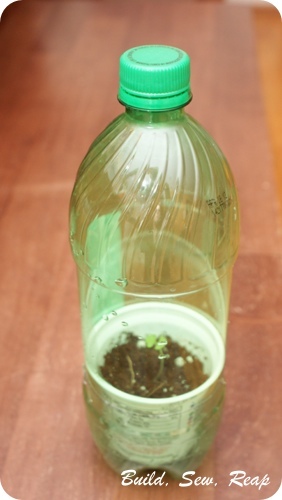 Another great advantage is I'll still be able to use the bottles as cloches if I need to. 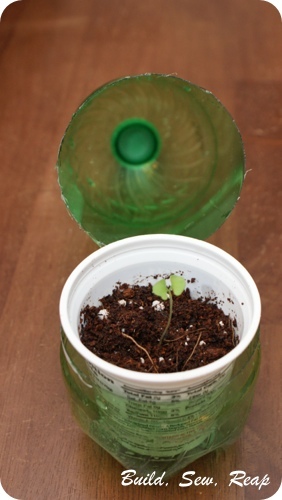 They're smaller than the typical 2 liter variety but if I need to keep any seedlings protected outside, I'll just clip the last 1/2 inch, remove the top part of the bottle and press it into the dirt around the plant. Love it! Great minds think alike! I used pudding cups and a plastic bag! A couple of years ago I used yogurt containers and plastic produce bags. They were nice and big. Unfortunately I then managed to fry all my starts when I set my timer wrong and the very warm sun light never turned off. This time I have an appropriate fluorescent light (that doesn't heat up) and figured out how to use the timer. I heard of someone using those big 2lb tubs of spinach or salad greens (think Costco) as greenhouses. I thought that was a great idea too.